Early shop houses- usually 6-7m wide and 30m deep, sometimes to 60m. Goods displayed along full width facing 5-foot way, leaving a narrow central aisle. Early 19th century, influx of Chinese immigrants from provinces of Guangdong and Fujian came as labourers or to seek their fortune. 5 major surnames- Khoos, Tans, Yeohs, Cheahs and Lims – held control over the southern Chinsese community with each setting kongsi houses reflecting their lineage. This splendid building was designed in 1913 by a British architect named Mr. A.B. Hubbock. Construction work began a year later by a local contractor. The Moorish style building was finally completed in November 1917 after being halted by the First World War (1914 – 1918) at the cost of RM780,422. The building is a unique blend of various architectures, and has elements from 13th and 14th century Ottoman and Mogul empires as well as Gothic and ancient Greek designs. The ground floor is adorned with 97 large frontal Gothic arches and four smaller ones. The high and wide verandas skirting the building create a cooling effect and are suitable for the constant high temperature of Malaysia. The first floor has 94 large arched windows of Gothic design and four circular arches of smaller size. The second floor has 171 Gothic arches and four large and 12 small circular arches. Five domes sit majestically on top of the building, each surrounded at four corners by entwined columns. They are of orthodox Greek design typical in the 14th century. This historical building suffered serious damage twice in its lifetime, first during the Second World War when its north wing was bombed. The second incident occurred on November 14, 1968 when the second floor of the same wing was gutted by fire. 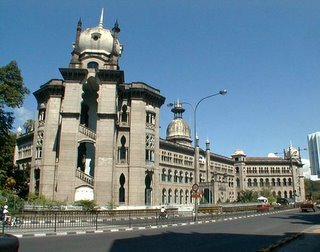 In 1983, the KTM Berhad headquarters was gazetted as an "Old Monument and Historical Site" and is fully protected under Sections 15 and 16, Historical Relics Act 168/1976. 1400 - Parameswara, Hindu prince from Palembang flees Temasik ancient Singapore and founds Malacca. 1403 - The first official Chinese trade envoy lead by Admiral Yin Ching arrive in Malacca. 1409 - - Admiral Cheng Ho , Commander of the Chinese Imperial fleet, arrives in Malacca on the first of his seven voyages to the Indian Ocean. 1411 - Parameswara journeys to China with an entourage of 540 and meets the Ming Emperor Yung Lo. 1414 - Parameswara marries a princess from Pasai (Indonesia) and embraces Islam and changes his name to Raja Iskandar Shah. 1424 - Sri Maharaja, Parameswara's son, becomes Sultan. He converts to Islam and takes the title Muhammad Shah. 1446 - Raja Kassim ascended the throne with the title Sultan Muzaffar Shah and declared Islam as the state religion. Under his rule Malacca prospers. 1447 - First attack from Siam. Later they were defeated in battle near Muar. 1456 - Tun Perak becomes Bendahara , Prime Minister with the title Bendahara Paduka Raja. Served under four Sultans, he is responsible for Malacca's rise to power in maritime Southeast Asia. 1458 - Sultan Mansur Shah succeeds Sultan Muzaffar Shah. Tun Perpateh Puteh envoy to China brings the Chinese Princess Hang Li Po as a wife for the Sultan. 1477 - Sultan Mansur Shah dies. He is succeeded by his 15 year old son Alauddin Riayat Shah . 1488 - Sultan Alauddin is poisoned in Pagoh. Sultan Mahmud Shah a cruel and tyrannical ruler succeeds him. 1498 - Tun Perak dies. 1500 - Tun Mutahir replaces Tun Perak as Bendahara with the title Bendahara Seri Maharaja. He became the grandest and most powerful of all the Bendaharas. 1509 - The first Royal Portuguese trading expedition commanded by Diego Lopez de Sequiera with a fleet of 18 ships arrives in Malacca hence the first European to arrive here. The locals called them `Benggali Putih'. A misunderstanding with the Malays took place and they were attacked but escape leaving behind twenty men as prisoners. 1510 - Bendahara Tun Mutahir allegedly plots to assassinate the Sultan. Sultan Mahmud Shah executes him and his entire family. Sultans Ahmad Shah succeeded the throne temporary from his father Sultan Mahmud Shah. 1511 - Alfonso d' Albuquerque and his Portuguese fleet attack Malacca on the 10 August 1511 and built - A Famosa . The Portuguese ruled for 130 years and thus Malacca passes into colonial hands for four and a half centuries. 1512 - In January Albuquerque returns to Goa after completing the "A Famosa". Sultan Mahmud Shah attacks the Portuguese. 1518/1519 - Sultan Mahmud Shah orders his subjects to built high walls around Malacca within three months. 1523 - Sultan Mahmud once again tried unsuccesfully to recapture back Malacca. 1525 - Laksamana Hang Nadim besiege the A Famosa fortress. Food rationing from Goa is carried out. 1537 - The Achenese attacked the Portuguese in Malacca for the first time. 1545 - Saint Francis Xavier visits Malacca on the first of his five sojourn in the city. Malacca was used as his base in the East and from here he attemps to get permission to travel to China. 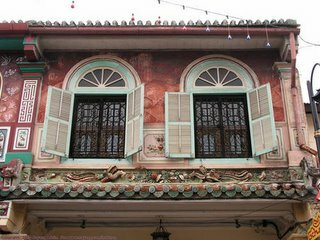 1548 - The first school in Malacca, St Paul's College is established by Saint Francis Xavier for the Portuguese Catholics and newly converted locals. 1551 - The combined army of Johor, Japara and Perak besiege Malacca city for three months. 1553 - Saint Francis Xavier dies from fever on the Island of Sancian near Canton, China. His body is buried in St. Paul's Church for nine months then transferred to Goa, India. 1568 - Johor helps the Portuguese to fight off the Acehnese who terrorize the Malacca Straits for sixty years. 1571 - A storm foiled a failed attempt attacked on Malacca by the Acehnese. 1575 - Japara once again launched an attack on Malacca. 1582 - The Portuguese help Johor ward off another Achehnese attack, and Sultan Abdul Jalil Riayat Shah of Johor the first of the former Malay royal house to visit Malacca. 1587 - Johor launch a huge land and sea attack on the Portuguese who are saved only by reinforcements from Goa. 1588 - Ralph Ritch the first British to visit Malacca. 1597 - The Dutch attack Malacca for the first time. 1606 - The Dutch under Admiral Matelieff de Jonge, teams up with the Sultan of Johor and attack Malacca. After a three months seige the Portuguese survive the attack when troops from Goa arrive. 1615/1616 - The Achehnese attacks Malacca. 1628/1629 - Achehnese captured Malacca for eight months before the Portuguese recapture it again. 1636 - The Dutch destroyed Portuguese ships at the Malacca harbor. 1641 - Malacca fell to the Dutch on the 14 January 1641. The Portuguese Governor, Manuel de Souza Couthinho surrenders the city to Captain Minne Williemson Kaartokoe. 1645 - The Cheng Hoon Teng is founded by Kapitan Lee Wei King. 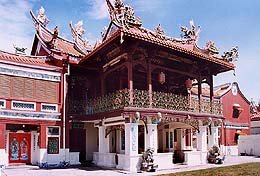 It is the oldest functioning Chinese temple in Malaysia today. 1650 - The Stadthuys the Dutch administrative centre and home of the Governor is built. 1710 - St. Peter's Church, the oldest functioning Christian church in Malaysia, is built after the Dutch restore freedom of religion to the Catholics. 1753 - Christ Church, built next to the Stadhuys in the Town Square, is completed after twelve years. 1756- The Bugis under the command of Daing Kamboja attacks Malacca. 1784- Raja Haji tries to capture Malacca but is killed in battle at Teluk Ketapang. 1795- The English East India Company takes over Malacca temporary during the Napoleonic wars. 1807 - Under William Farquar, the English begin demolishing A Formosa fort and transfer the city's population to Penang. The cost for demolishing the fort was 70,000 pounds. 1808 - Sir Stamford Raffles arrives in Malacca and on his recommendation the city was saved from destruction and the plan to evacuate was abandoned with the approval of Lord Minto. 1818 - Malacca is restored to the Dutch under the Treaty of Vienna after the Napoleonic Wars. 1819 - Sultan Husin Mohamad Shah hands over Singapore to Sir Stamford Raffles of the East India Company. His grave is located in the grounds of Tranquerah Mosque. 1824 - The Anglo Dutch Treaty or the Treaty of London was made between the Dutch and the British. The British gives Bencoolen, in Sumatra to the Dutch and Malacca to the English. 1826 - Malacca, Penang and Singapore are incorparated as the Straits Settlements of the India government under the British. 1867 - The Straits Settlements become a Crown Colony under the Colonial Office in London. 1895 - The first rubber trees were planted by Tan Chay Yan at Bukit Lintang, Malacca. 1901 - The Queen Victoria Fountain made of English marble is erected to commemorate the Queen's Diamond Jubilee (1837-1897). 1941 - 1945 - The Second World War1942 - Malacca is occupied by the Japanese. 1945 - Malacca is restored to the British after the Japanese surrender in Singapore. 1948 - The Communist controls Malaya for 14 days. The British declare a state of "Emergency" which lasted for twelve years against the Communist Terrorists. 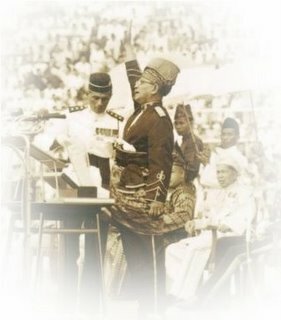 1956 - Tunku Abdul Rahman, Malaysia's first Prime Minister, announces the news of impending indepandence to 50,000 people gathered at the Padang Pahlawan, Bandar Hilir, Malacca on his arrival from London on the 20th of February. 1957 - Malaysia gains "Merdeka" independence on the 31 Agugust 1957 from the British. 1963 - Formation of Malaysia.with Malacca, Singapore, Sabah and Sarawak forging a new nation. 1989 - Proclaimation of Malacca as a Historical City on the 15 April, 1989. For those who has followed all the articles that have been posted here by the aspiring students of MATTA SCHOOL OF TOURISM batch August 2005, it is befitting to write a brief summary of the past 3 months with less than a month before the exam. Practically starting from a ‘blank look’ to both our instructors( of 'yin and yang' balance) on the first week of lessons, I can safely says that these past 3 months have taught me more on my home country than the past years of my life in Malaysia. It has indeed “open my eyes” to what seems to be a usual mundane scenery or event, but having gone through three months of our course, now everything ordinary before, has a significant meaning behind it. Whether it’s the history or the architecture, or just a plain simple purpose of it been there in the first place made by nature; everything screams out a story to tell. What’s great about it is that the time of how it all builds up like a jigsaw puzzle…piece by piece…filling up the empty space in the puzzle as the days goes by. And now with less than a month before our exam, the jigsaw puzzle is falling into place with a clear picture on what the actual puzzle is going to look like. There are many things that we can always recall back on, from the “umm…” to the “ahh…” and to the “errr…”, well that was how our commentary first sounded like. Ohh.., and not forgetting the look on our face as we are trying to recall all the facts and details, some of us have the “look straight but mind wonder” kind of look. Some is the “look up to the ceilings” hoping that somehow the facts will drop in by the pull of gravity. And then there is the “hand rubbing” type of like rubbing the magic lamp. Not forgetting the “shaky voice” type ,where the voice seems to changed to “Tina Turner” before the count to 10 (Hey guys…we know who this ‘shaky voice’ belongs to so… “shhh”) Of course you won’t be hearing from us who is the one carrying the different form of commentary in class, we have what our instructor taught us, the “esprit de'corp” spirit. So to all those new students, don’t give up on your ‘struggle’. Because regardless how the results turns out, we have already accomplished what many are still ignorance about. And that is what Malaysia has to offer and what being a Malaysian is it all about. We can also be thankful that ‘we are hearing the story’ as we walk past a building we have been ignoring before, because we cannot hear its scream. And now that we do, isn’t it great that we have the chance to share it with someone? On that note, I am glad that I have finally written something that is entirely my own production without a single ‘copy’ and ‘paste’ in it. You will know what I am talking when you progress to week two. Right; a word or warning .Many of us now belongs to the “Insomnia Club”. ‘Membership’ recruitment is still on-going. White washed walls. Cold, sterile corridors. A feeling sterile corridors. A clinical odours. A feeling of dread. At one time, these may have been the words to describe the average hospitals. These days however, walk into a hospital and you cannot help but to compare it to five star hotels. Wall paper corridors, nice soft lighting, tasteful furniture and beautiful furnishings have replaced the much stereotyped hospitals of yesterday, ready to provide visitors a warm welcome and much needed comfort and attention. Along with the interior and exterior makeover comes a refreshing re-positioning of Malaysia’s medical industry that has made the experience of seeking medical treatment and health services a more pleasant and stress-free one. Health Tourism in Malaysia has grown tremendously in the last 4 years thanks to Malaysia government which has taken lead in paving their way for this niche market to grow and promoting positive changes to take place in the industry. Hence, in recent years, Malaysia progressively emerging as a centre for Health and Wellness not just in the region but world wide as well. With the wide range of medical services offered, from high tech equipment, excellent facilities to qualified medical staff Malaysia is ready and able to meet the need of those who are looking not only for medical or curative treatments but also for diagnostic and services. With the wealth of medical faculties, expertise and treatments available, Malaysia has earned itself a reputable position on the global map. Malaysia has been receiving encouraging numbers of foreign visitors seeking medical services in recent years. Based on Tourism Malaysia’s statistic, the number of foreign patients has quadrupled from 44,640 in 2001 to 174, 189 in 2004. Angioplasty, haemodialysis, eye care, cosmetic and anti-ageing services and cancer therapy. Dental services such as orthodontics, dental implants and oral surgery. Why choose Health Tourism in Malaysia? Malaysia is served by highly trained specialists in various fields, with internationally-recognized qualifications. The support staffs are well trained in patient-care and offer only best professional services to patients. Malaysia is also proud of its stable of specialist hospitals that cater specific medical disciplines. Equipped with most modern facilities and equipment include the internationally-renowned National Heart Institute and Tun Hussein Onn National Eye Hospital. Other specialist medical hospitals e.g. oncology, urology, neurology, cardiology and nephrology.Most private medical centres have achieved certifications for internationally recognized quality standards, e.g. MS ISO 9002 or accreditation by Malaysia Standard Quality of Health (MSQH). The hospitals also offer an excellent accommodation patient-care services. Comfortable and well-appointed rooms available for patients whether they prefer single occupancy rooms or tastefully-decorated suites. A major plus point is Malaysia offers affordable medical costs compared to other countries (US 14times or Singapore 2times for example). Malaysia’s exchange rate is favourable to many major countries in the world. Many patients have expressed that in Malaysia, the same budget can get them both medical treatment and a short holiday to aid the recuperation process. The employment of English speaking, multi ethnic medical staff from various religious back grounds in also Malaysia’s favour. The medical service staffed by Muslims, Christians, Buddhists and Hindus who would be more sensitive to a patient’s particular religious needs. Malaysia as a Muslim country, offers Muslim visitors from around the world a comfortable medical experience that will surely put their hearts at ease. Halal food is easily available in wide variety of choice and patients can totally assured that the quality and preparation on the food are in accordance of is strict religious standards. Malaysia popularity as a preferred destination as Health Tourism is attributed to its pleasant tropical weather and breathtaking natural attractions. It is not uncommon for patients to extend their stay in the country to recuperate or simply relax in the wonderful weather. This is easily arranged as many hospitals are situated in major cities like Kuala Lumpur, Johor Bharu, George Town, Malacca and Kuching. These hospitals are also located near tourists’ attractions such as cool highlands, the secluded beaches and tranquil islands where there is a good choice of hotels and beautiful resorts. Also its accessible to major international airports. With such aggressive efforts being to promote medical tourism in Malaysia, more and more travel agencies and companies in the tourism industry are beginning to recognize potential of this niche market. Attractive health tourism packages are being treated, and even tailored made to suits this special market’s needs. MOUNT KINABALU - THE STORY BEHIND. The fertile slopes of Kinabalu are home to the Kadazandusun, Sabah’s largest ethnic community. Traditionally rice farmers, their “kampungs” or villagers are scattered all over the hill slopes as some still practice shifting cultivation. It’s not unusual to see them scampering up and down the mountain without exhaustion! And that’s exactly why you’ll find most of them working as mountain guides and porters. The Kadazandusun people consider themselves the guardian of Mt. Kinabalu. They believe this is sacred ground, a resting place for the spirits of their ancestors. Earlier attempts to climb the mountain had been forbidden, as to do so would have disturbed these spirits and incurred their wrath. That was why by the standards of other world-class mountains, Mt. Kinabalu was “discovered” rather late. It was only in 1851 that Sir Hugh Low led an expedition up the mountain. A compromise with the locals was reached and a sacrifice to appease the spirits was made at the halfway point. This spot was named Panar Laban, a Dusun word meaning “Place of Sacrifice”. The local guide scarified a white cockerel and seven eggs to appease the mountain spirits. This ritual is performed annually to this day. 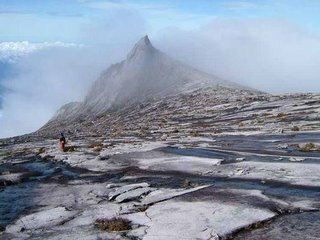 The name “Kinabalu” is derived from the Kadazandusun words “Aki Nabalu”- where “Aki” literally means “ancestor” and “nabalu” is the word for mountain – thus, the sacred resting place of the ancestral spirits. Legends of the Kadazandusun have told of the supreme deities creation of the world and Mt. Kinabalu. There are also folklores of a mythical dragon guarding a treasure trove of pearls. These myths take on a more surreal presence when you are up in the mountains, in the silence and mist of the swirling clouds. All climbers are advised to always behave respectfully and be on good behavior. 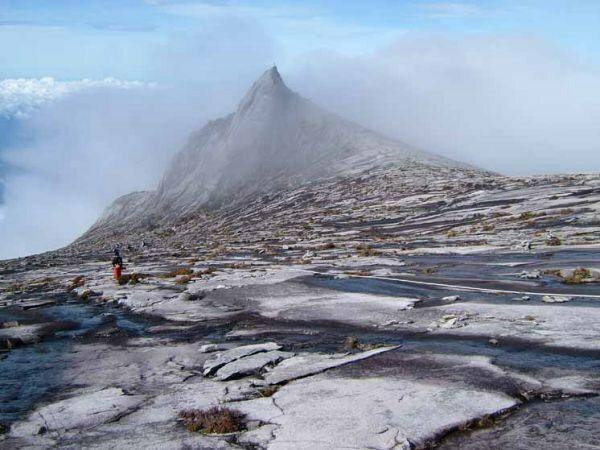 The origins of the name Kinabalu is also somewhat shrouded in mystery and myth. Some believe Kina-balu means "Chinese widow". Kina being a corruption of China and Balu a widespread native dialectical term for widow. There is the story of a Chinese Prince seeking a priceless pink pearl that was said to be at the very top of the mountain and guarded by a ferocious dragon. After a terrific battle he slayed the dragon and took the pearl, he then married a local Kadazan woman (a princess, of course). However after a time he became homesick for China and left his wife, who broken-hearted, went back to the mountain and was turned to stone.